The long immigration corridor from all parts of Mexico to all parts of the United States has brought some of the most gratifying results to the American restaurant industry, especially with ambitious, eager and talented chefs. 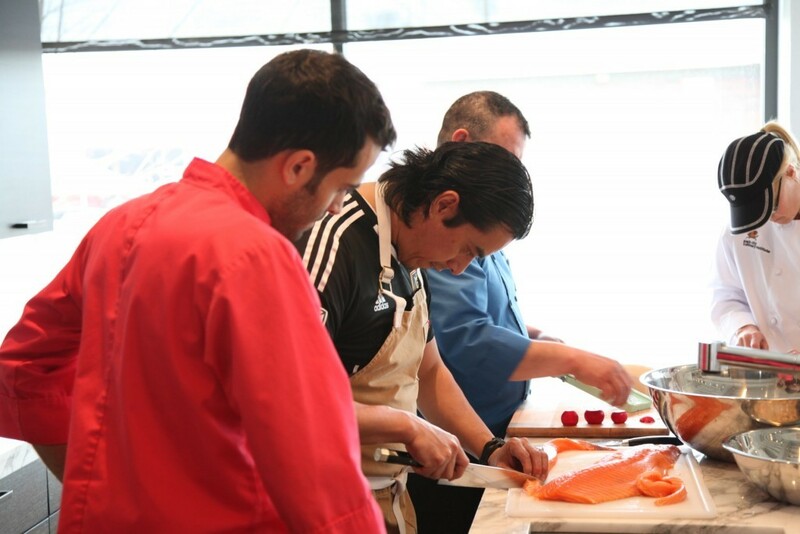 No doubt, Carlos Gaytán, who spent three days last week in Salt Lake City in culinary events to raise scholarship and programming funds for Artes de Mexico en Utah, epitomizes the possibilities for all young immigrants who enrich the American experience with a flair for hybrids of creativity and innovation. Gaytán, owner and executive chef of Chicago’s Michelin-starred Mexique restaurant and an 11th season finalist in Bravo’s Top Chef competition, came to the United States 25 years ago, first working as a dishwasher before landing a cook’s job in the city’s Sheraton North Shore Hotel. Originally from Huitzuco in the Mexican state of Guerrero located in the country’s southwestern region, Gaytán’s culinary genes, so to speak, were steeped in a cuisine influenced by Spanish and French traditions as well those of indigenous people. The region is known for pozole blanco, mezcal, chilpancingueñas (a leavened wheat bread), quail and seafood cuatete made with the area’s distinctive blue catfish, just to name a few items. However, he also laments what the harsh debate about immigration has meant for the restaurant industry. 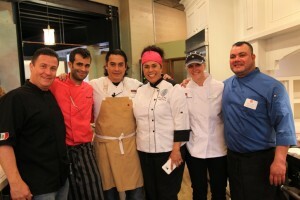 “So many young people in Mexico have such a passion for food and are so eager to come here and learn as much as possible about technique in the kitchen,” says Gaytán, who worked with gifted chefs such as Dominique Tougne at the Bistro Margot in Chicago, where he studied with the chef every morning to learn and perfect French culinary techniques. 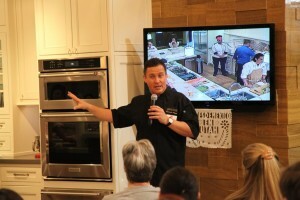 Honorary assistant chef Eduardo Arnal, the Mexico Consul to Salt Lake City. Photo: Edgar Gomez. Latinos, and immigrants from Mexico, in particular, have kept the restaurant industry going, as suggested in a 2015 Washington Post article. In 2010, the U.S. Bureau of Labor Statistics estimated that at least 1.4 million out of a total of about 12.7 million workers in the restaurant industry were immigrants. The Pew Hispanic Center estimated that about 20 percent of the country’s more than 2.5 million chefs and cooks were undocumented immigrants. Despite the issues with finding workers, Gaytán says the current period has been wonderful for Mexican restaurants which emphasize a fine, ambitious cuisine that goes well beyond the usual fare of Tex-Mex inspired tacos, burritos and enchiladas. He opened Mexique nearly eight years ago, and quickly gained the attention of critics and diners, including one of Chicago magazine’s top new restaurants of 2009, best restaurant of 2010 and received its first star in the Michelin Guide in 2013. In Salt Lake City, he cooked for three days at Frida Bistro, calling it a “wonderful ambassador” for outstanding Mexican cuisine, and an impressive sign of the cosmopolitanism which has made the city’s culinary scene that much more ambitious and adventurous. During a cooking demonstration in one of the kitchens at Mountain Land Design in South Salt Lake, he was comfortable, genial and witty, almost as if he was in his own kitchen at home or in his Chicago restaurant. 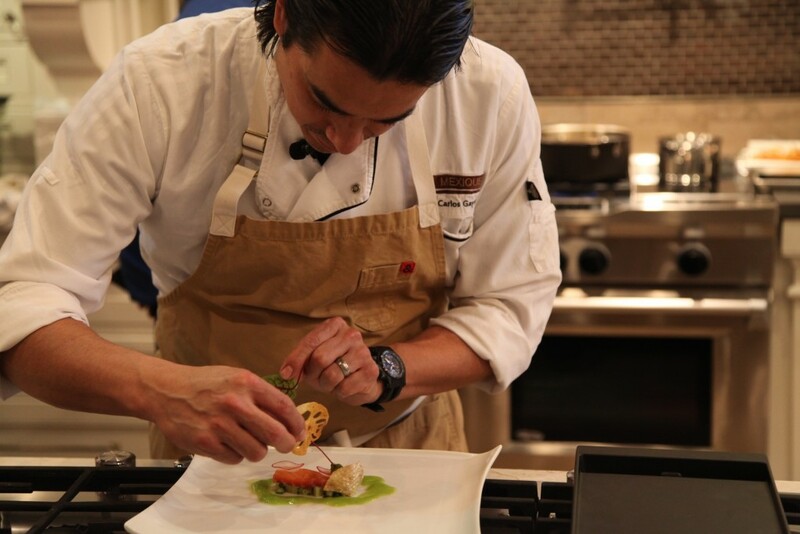 He prepared one of his signature ceviche dishes, which brings together elements of Mexican, French and Asian influences. The salmon was served sashimi style in meticulously cut cubes, adorned with fresh greens, cucumber, passion fruit, beautifully sliced radishes, a mustard seed caviar made with squid ink, and a smooth aguachile dressing made with tangerines, lime juice, cilantro, rosemary and chile peppers. The dish was capped with a fried lotus root chip. 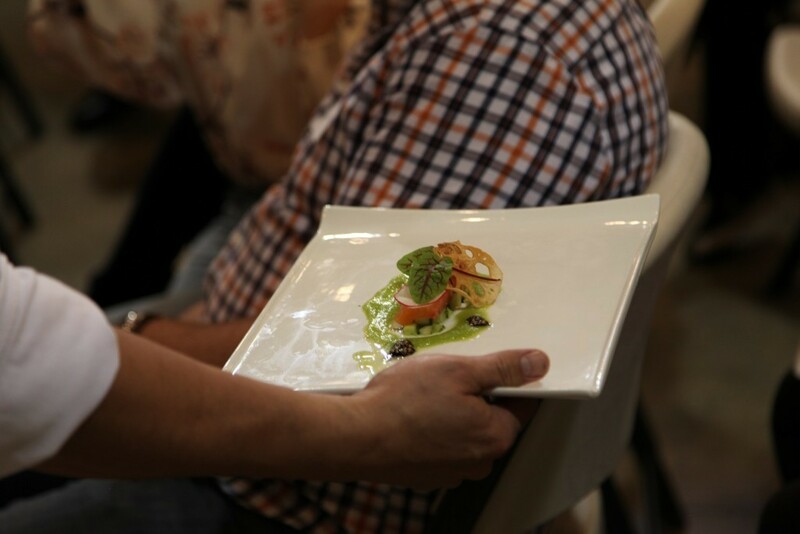 He prefers to let the presentation of his dishes to provide the artistic focus in the overall dining experience. The ceviche suggested the color composition of a Matisse or Chardin. It proves to be a versatile dish, according to Gaytán, who says it work wells with salmon, tuna, cobia or other firm flesh seafood proteins of sashimi grade. The aguachile is a pulverized liquid dressing, central to many ceviches in Mexican restaurants. It, too, is versatile, and one can adjust the heat level of it, depending on the preference for jalapeno, serrano, or, for the most daring, habanero pepper. He was assisted by several local chefs including Chalia Escalona, chef, Brulee Catering; Alberto Higuera, executive chef at Cannella’s and Taco Taco; Zach Howa, chef, La Caille and Dawn Hoffman, a student at Park City Culinary Institute. Gaytán invited Eduardo Arnal, who is leaving this week as Mexico’s Consul in Salt Lake City to return to work in Mexico City. He was surprised after finishing his guest cooking stints at Frida Bistro that he could not find a place for a decent meal after 11 p.m. “This would be a big negative in Chicago,” he adds. Artes de Mexico en Utah offers a full line of programming in Mexican art, history, literature and culture. It recently has broadened its offerings to include an upcoming program in Chicano Hip Hop. A student competition for original literature and poetry in Spanish also is underway.